What is your favorite place to shop for Christmas? 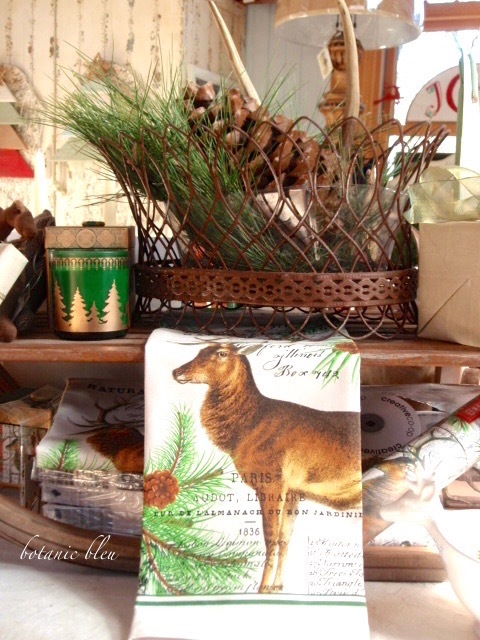 My favorite kind of Christmas shop is a small store that has distinctive gifts not found in large department stores. As I approach the store, beautiful Christmas decorations greet me even before I open the door. 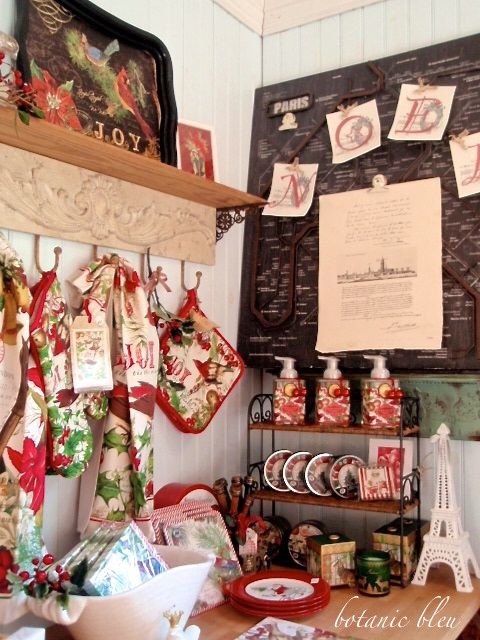 Inside, the whole store is filled with Christmas, arranged in small vignettes with unusual ribbons, gift tags, ornaments, and things made from wood, glass, and fabric. There may be a handful of plastic things, but they are so well made I do not realize they are plastic/resin until close inspection. I leave the store with bags and bags. Over the years, my favorite small distinctive shops closed, one by one, leaving me wishing for a new shop to open to fill the void. Open my own special seasonal shop, and fill it with all the things I love. 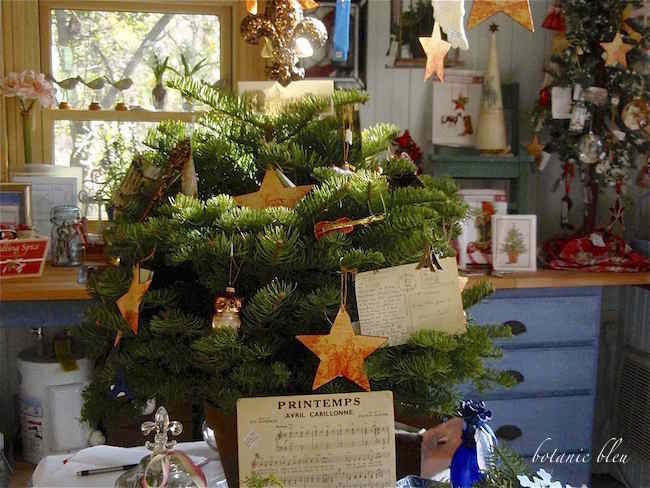 The Sixth Annual French Country Christmas Event is this year. Here are photos from years past so you can see what has filled my special shop before. No two years are exactly alike. 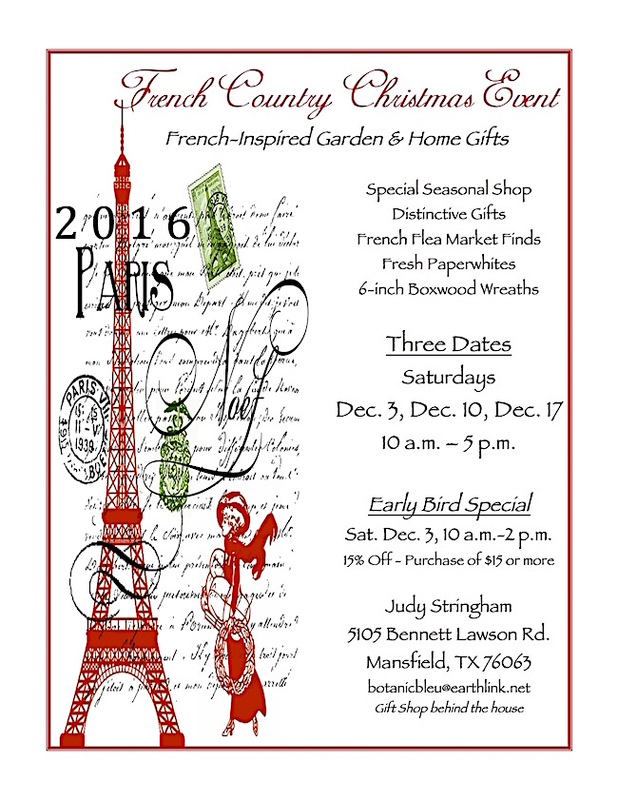 French Country Christmas became a reality. 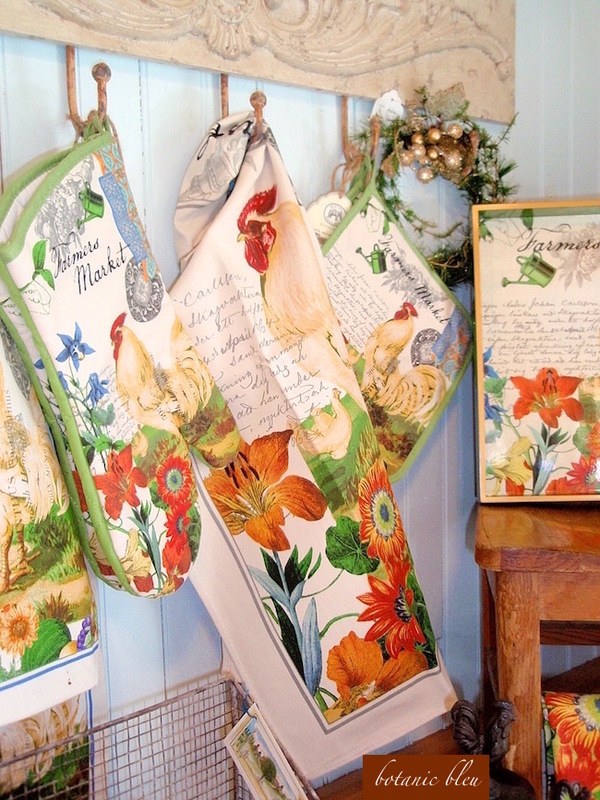 I shop all year for special things, including new items from the Dallas Gift Market, but also including vintage items found in Deep South flea markets, found in brocantes in France, and handcrafted, repurposed items. Fill it with beautiful paper goods, seasonal linens, fresh paperwhites, soaps, and unusual year-round pieces like a three-foot square metal replica of the Paris metro. Offer the newest patterns each year from my favorite vendor, Michel Design. 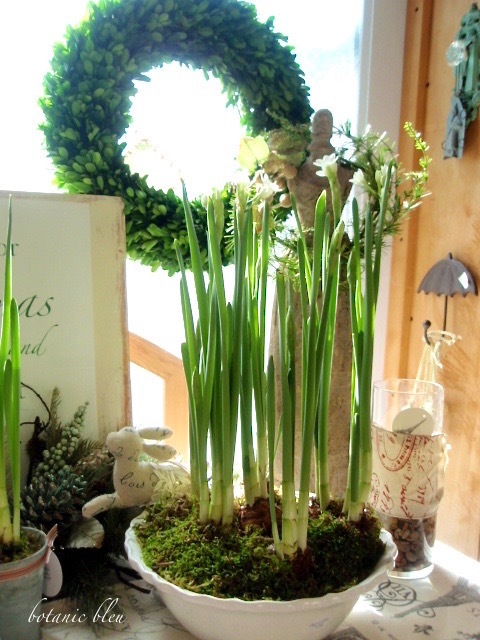 Always include fresh paperwhites planted in beautiful containers... from one bulb per container to a bowl full. Hold the seasonal sale in my rustic garden shed, and include birds, bird nests, bird cages, and one year, a bird-decorated little chest of drawers (two sold to dear friends, no longer available). Seeing the building's design is a treat. Always search for French-inspired items. 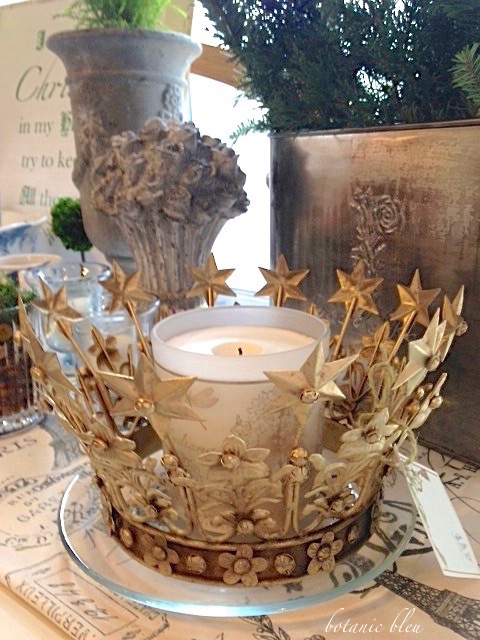 Crowns, French-style pots, and French-inspired decor are among my favorite pieces each year. Include non-seasonal linens with a French connection for year-round use. Offer lavender and hydrangea patterns. Offer one-of-a-kind treasures like a vintage wooden sled from Europe. 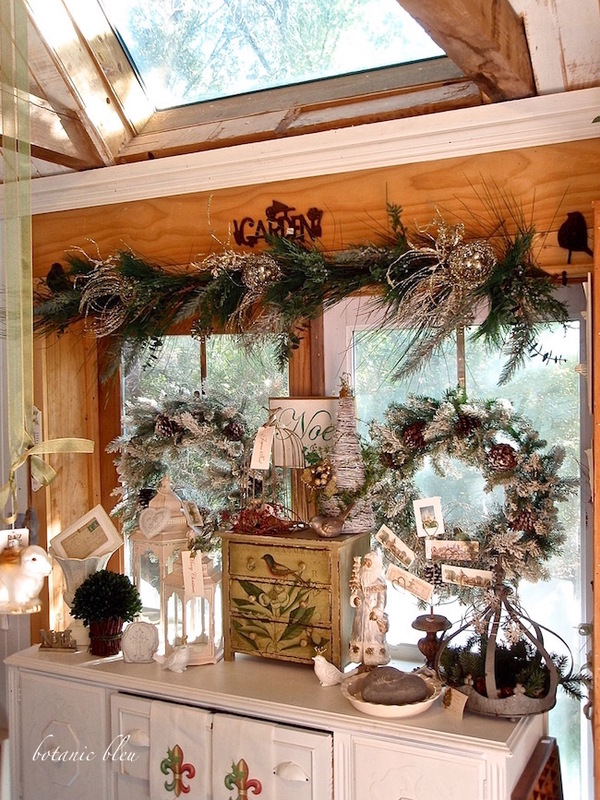 Offer French wire baskets filled with greenery and real antler sheds. Include small items that make your heart happy. 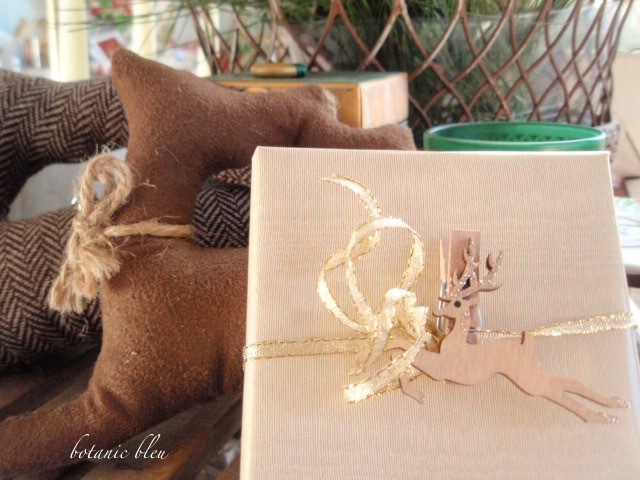 Wooden deer clips with glittered hooves and antlers are perfect to decorate gifts, to attach flags to banners, to hold small bags closed, to clip to small Christmas trees as ornaments, to attach Christmas cards to cardholders.... One little deer can do so much. Do all of these photos show things in THIS year's event? No, but wait until you see the special things found for this year. and maps for getting to the event. See Botanic Bleu's Facebook page for sneak peeks at things that will be in this year's sale. May you have a relaxing time with family and friends, eating, watching football, PLAYING family touch football, and my childhood favorite... watching the Macy's Day Parade. When I count my Thanksgiving blessings, all of my blogging friends and readers are part of my counted blessings. There is always something to be grateful for in your world. Everything looks beautiful! 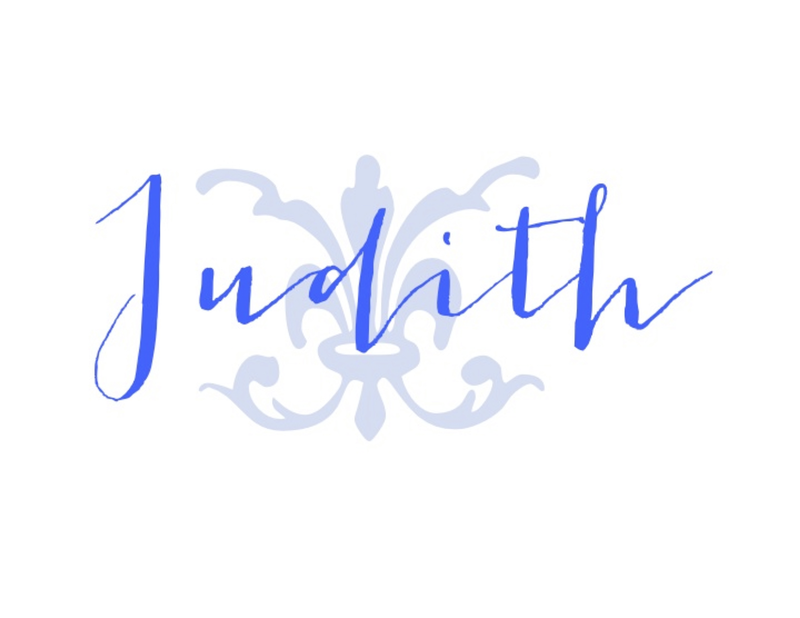 Happy Thanksgiving, Judith. My kind of shop. I want one of everything. Oh I wish I was closer! I'd pop over and shop. What a wonderful idea! Everything looks fabulous Judith! I might actually be able to make it on the 3rd. Here's hoping! Can't wait to see you in person my friend, fellow Texan, planet earth!